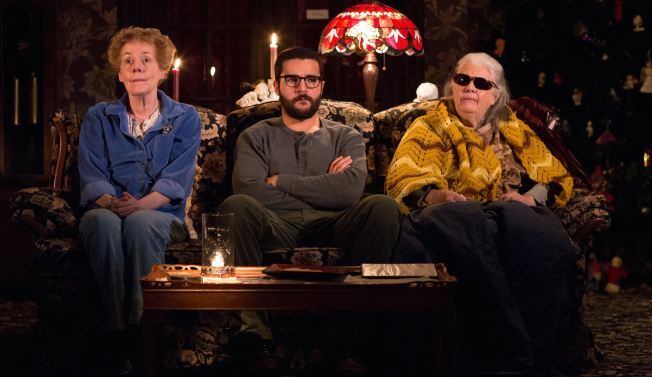 Georgia Engel , Christopher Abbott and Lois Smith in "John," a new play by Annie Baker. A pair of Brooklynites on the cusp of a break-up spend a couple of days in a suffocating Gettysburg, Pa., bed-and-breakfast in “John,” the first show of Annie Baker’s Signature Center residency. If you’ve seen Baker’s Pulitzer Prize-winning drama “The Flick” -- it’s still running down on Barrow Street -- you’ll be at ease with the naturalistic dialogue here, which is just as memorable. Directed by frequent collaborator Sam Gold (“Fun Home”), “John” comes in at over three hours, with two intermissions … and plenty of painfully human awkward pauses. “John” is notable as well for its marvelously quirky performance by Georgia Engel, who is best known for her role as the good-natured Georgette on “The Mary Tyler Moore Show,” and who has guest-starred more recently on “The Office” and on “Hot in Cleveland,” opposite her one-time “MTM” co-star Betty White. In “John,” Engel stars as Kitty, the owner of a B&B that once served as a hospital for wounded Union soldiers. Designer Mimi Lien has crammed the living room with miniature houses and American Girl dolls. Every surface, from the walls to the seating, seems to be covered in a busy floral print. On a snowy night the weekend after Thanksgiving, Elias (Christopher Abbott, of HBO’s “Girls”) and Jenny (Hong Chau, of “Inherent Vice”) arrive at the B&B on their way home from Ohio. He’s a Civil War buff, which is why they’ve made this detour. But here, they’re going to be forced into pleasantries with their hostess, even as their relationship is collapsing under its own weight. The passage of time is a recurring theme in “John,” and Baker and Gold leave Engel to do the heavy lifting. She manually closes the theater’s heavy curtain at the end of each act. During each scene change, she advances the hours on the grandfather clock in the center of the living room, a process that sometimes feels long and drawn out. The lighting cools or glows in sync with her actions. While Baker and Gold are surely capitalizing on our affection for the perpetually smiling Engel, there’s something mysterious brimming just beneath Kitty’s surface. She is someone who utters genteel aphorisms to indicate surprise (“I’ll be dipped”), yet she speaks often about an ill husband who lives on the premises, but whom we never see. Is he even there? And why does she react so strangely when Elias picks up the journal in which she claims to be writing only about the Gettysburg sunsets? Review: LuPone, Urie in "Shows for Days"
The fourth character is Genevieve (Lois Smith, of “True Blood”), who is blind and, many decades after the split from her husband -- one of two men named “John” in the play whom we never meet -- is still deeply affected by their relationship. Smith’s performance is interesting and eccentric, primarily because she’s just coherent enough to comment on her own insanity. Like Genevieve, Jenny also has a man named John in her past. And like Genevieve, Jenny would like to think she’s left her “John” behind, though it becomes terribly evident that she has not. “John” is full of attempts by lonely characters to relate to one another, just like “The Flick.” Ultimately, “John” is a darker story, one that leaves audiences grappling with questions about how much they trust the people with whom they’re most intimate. It’s worth it, if the idea of such a meaty and drawn out story doesn’t frighten you. “John,” through Sept. 6 at The Pershing Square Signature Center, 480 W. 42nd St. Tickets: $25-$55. Call 212-244-7529.